M3@sunwinner Hotel is a newish, five-storey building painted bright scarlet and right in the thick of things offering spotless rooms at reasonable rates. Average rating 8 from 88 reviews. If you’re wondering about the name, their brochure’s explains that the M3 stands for men, management and materials; they don’t say what ‘sunwinner’ refers to. The all-air-con rooms come with cable TV, minibar, WiFi and the attached bathroom has a bathtub in the superior flavour. Little extras include tea and coffee and free bicycle use. Our only concern here is the room size. We were only able to see superiors and even these were small; the friendly staff told us standards are smaller again. so some design fault there. As is often the case lower floor rooms have no views though all rooms we saw did at least have windows. The plain but immaculate rooms are a reasonable deal for these parts though and you should be able to shave a few dollars off by booking online. 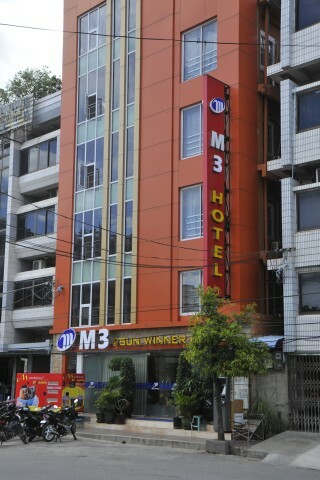 Check rates at M3@sunwinner Hotel on Booking.com.